Communities that have increased out-of-hospital survival rates have done so in part through public awareness campaigns, widespread training in CPR and AED use, as well as the placement of AEDs in public locations. 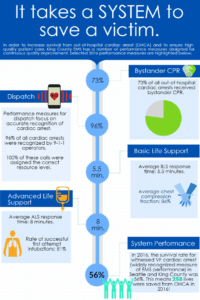 Leading the Nation in 2016 is Seattle, King County, Washington whose out-of-hospital cardiac arrest survival rate is 56% (the average survival rate for the remainder of the U.S. – if CPR is not administered in the first four to six minutes – is less than 10%). Our Foundation intends to achieve similar success by offering FREE community-based hands-only CPR training. Graphics taken from Seattle, King County, Washington annual report. Gwyneth’s Gift is striving to meet survival rates similar to King County, Washington. Gwyneth’s Gift Community Training Program engages citizens in the communities in which they live. Training events are run by Foundation staff and volunteers. We have partnered with organizations such as local hospitals (Mary Washington HealthCare), first responders (Stafford and SpotsylvaniaCounty Fire & Rescue), educators (Germanna Community College Nursing Program), and private companies (LifeCare Medical Transports) to conduct training. We have also partnered with civic organizations (Rotary Clubs, Boy Scouts of America, Rappahannock United Way) and industries(Hilldrup and Premier Eye Care) who have hosted training events. We will continue our efforts to build these meaningful partner relationships within the region. Equipment such as manikins, AED training devices, and AHA Adult & Child CPR Anytime kitsare utilized at all training events and are provided by the Foundation. The Adult & CPR Anytime kits are offered FREE of charge to individuals that participate in the Training Program. These kits allow users to learn CPR skills anywhere, from large group settings to their own homes and are designed to be shared among family and friends. Kits contain the following components: one bilingual (English/Spanish) CPR Anytime DVD, one Mini Anne CPR personal manikin, one bilingual Adult & Child CPR Anytime Skills Reminder card, and manikin wipe. For every kit distributed, The American Heart Association estimates that 2.5 additional people are trained. In fact, some CPR Anytime programs report that as many as 7-8 additional people per kit receive training. Are you interested in setting up a class for you organization or are you interested in volunteering your skills to help teach others? We appreciate all help and want to get your training day on our schedule. Hi, I would like to request training. We want to share it with you! Whether a simple question on AEDs, the foundation, our programs, or how you can get involved yourself? Click on this link and fill out the contact form and we will be pleased to provide you with all the ways you can be part of Gwyneth’s Gift Foundation and our mission to save lives.